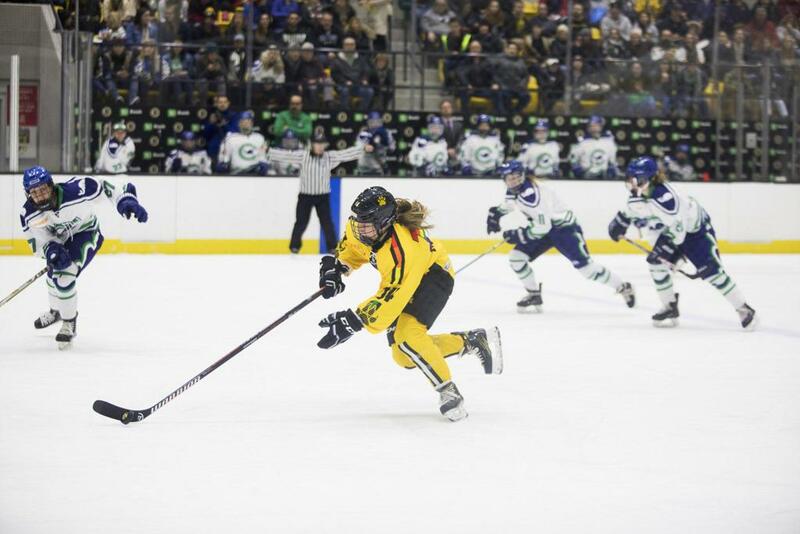 The Boston Pride took a 3-1 win over the Connecticut Whale on Saturday night in front of the Pride’s second consecutive sold-out crowd at Warrior Ice Arena. 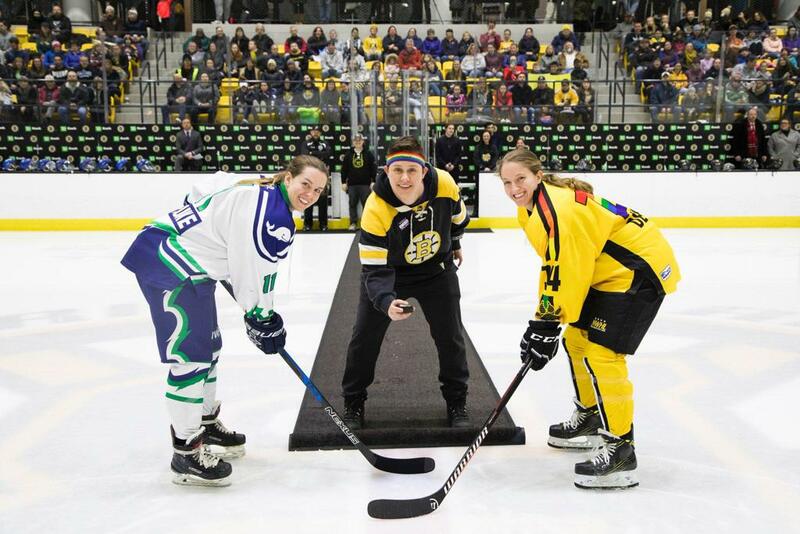 Saturday’s game also served as the Pride’s You Can Play Night, with Boston wearing special rainbow jerseys in support of the You Can Play project, which promotes inclusion in sports. The win moved Boston to 9-4, matching the record of the Buffalo Beauts, who defeated the Metropolitan Riveters on Saturday afternoon. Jillian Dempsey and Denisa Krizova each recorded a goal and an assist for Boston on the night. Dempsey leads the Pride and is tied for second in the league with nine goals on the season. The Pride wasted no time getting on the board, with Krizova finding the back of the net just 1:20 into the game on a pass from Dempsey to give Boston the lead. The early goal gave the Pride a jump, but Connecticut answered with a number of chances of their own, forcing Pride goaltender Katie Burt to make some challenging saves. But the Whale ensured the Pride wouldn’t go into the first intermission with the advantage. Rachael Ade threw a puck on net from the left boards that slipped in with just 55 seconds left in the first period to knot the score at one, marking her first career NWHL goal. Dempsey then netted one of her own less than two minutes into the second period to regain the lead for Boston, firing home into the top corner from the slot with McKenna Brand and Krizova picking up the assists. The Whale spent much of the third period on the penalty kill, and Toni Ann Miano took advantage 9:20 into the frame, tapping in a rebound that had come loose in front of the net to give Boston the 3-1 lead. In the waning moments, Connecticut pulled goaltender Shenae Lundberg in favor of an extra attacker, but Burt and the Boston defense held onto the two-goal advantage. Lundberg made 22 saves after signing with the Whale on a professional tryout earlier this week. Lundberg previously spent two seasons in the NWHL with the Whale and Riveters. At the other end of the ice, NWHL All-Star Burt made 25 stops, picking up another victory in net. Burt will be joined by Dempsey, Gigi Marvin, Lexi Bender, Alyssa Gagliardi, Haley Skarupa and Amanda Pelkey in representing the Pride at All-Star Weekend in Nashville next week. Katerina Mrázová, Michelle Löwenhielm, Emily Fluke and Shannon Doyle will be Connecticut’s representatives. After the All-Star break, Boston returns to action on Monday, Feb. 18, heading to Newark for a matchup with the Metropolitan Riveters. The Connecticut Whale are off until Feb. 24, when they return home to Terry Conners Rink for their fourth and final regular-season matchup with the Pride. Tickets are available at NWHL.zone/tickets.